The Paris 13 navy blue classic fit pyjama features a stunning paisley design with our signature rose logo worked into the geometric patterns. This intricate design is woven into a mid-weight fabric using a traditional jacquard technique to produce a layered and textured repeat pattern. With its satin touch, it feels as great as it looks. Although of Persian origin, the paisley design takes it name from the Scottish textile manufacturing town where paisley designs and other textiles were created during the 19th century. The elaborate pattern is digitised before being woven for a modern interpretation of a classic British design that will wow for years to come. 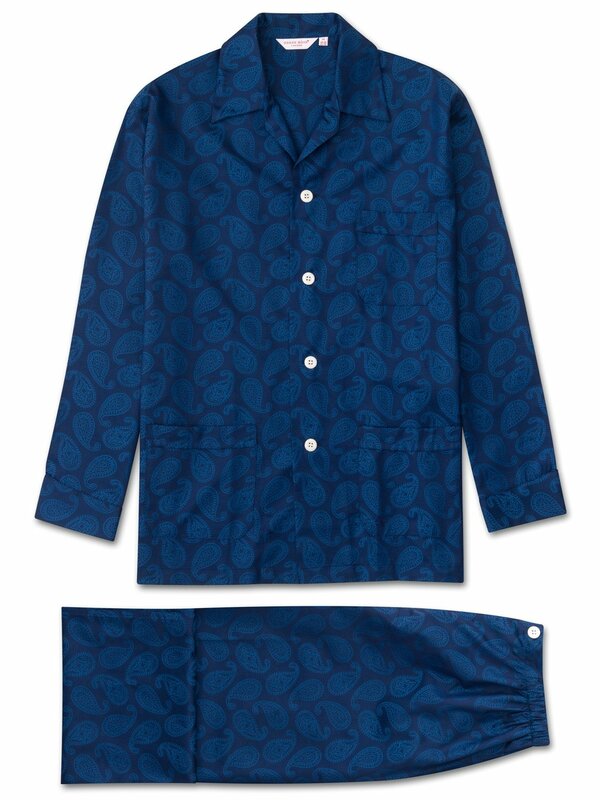 Made from 100% cotton but often mistaken for silk, the Paris 13 PJ features a three pocket jacket, classic collar and adjustable, mother of pearl two button traditional fly. This classic fit pyjama has a relaxed cut and elasticated sides on the trousers, meaning the front and back are flat for your comfort.